Julius Caesar stands out in history as one of most influential men who ever lived. The reason for this is that he is credited for laying the groundwork of the Roman Empire, which thrived for over four hundred years after his death. At the time he lived, the republic of Rome was torn apart by political and civil strife. The tasks of administering government in many far flung provinces, building suitable infrastructure, and regulating a professional army were overwhelming to a political system run by feuding oligarchs in a single city. Julius Caesar understood the drastic reforms that would be necessary to prevent the empire from breaking apart and he made great strides during his own life in this direction, although he destroyed the republic in the process. In his youth, Julius Caesar was popular and known to be personally courageous, but he also had a reputation as a reveler and a spendthrift, and did not show early signs of serious ambition. He did not rise to high prominence in the popular party until his late thirties, and held only minor offices until then. He was forty by the time he formed the first triumvirate with Crassus and Pompey, and at the time was the junior member. It was in the following decade, from 58 to 50 B.C., that he distinguished himself as a formidable leader in both the military and political domains. In his conquest of Gaul he is said to have taken up arms against over a million Gallic warriors, and killed another million. He completely subdued the entire region of modern France and made forays into Britain and Germany. At the same time he was achieving extraordinary military success, he wrote one of the greatest classic works of literature in the ancient world, "Caesar's Commentaries on the Gallic War." His personal and political popularity reached ever greater heights during this time, including everyone but the Senate and their supporters. After Caesar had served eight years in Gaul the fearful Senate requested that he disband his armies. At that point he made the difficult decision to march to Rome. This essentially forced a civil war, but Caesar hoped to reconcile with his opponents rather than destroy them. All of Italy surrendered to him without a battle and his enemies, led by Pompey, were forced to flee to the East to raise armies there. At the battle of Pharsalia, only one year after he crossed the Rubicon, his most important enemy, Pompey, was defeated. It took another year to consolidate his power and put down minor revolts throughout the empire. At all times Caesar was as conciliatory as possible and pardoned his opponents without hesitation. By 46 BC the empire was completely pacified and he returned to Rome to start his work of reform and reorganization. He had advanced ideas on many topics, from the building of roads, communication and infrastructure, to a revamped system of taxes, to a change in the very idea of Roman citizenship and voting rights. His career was cut short by assassination, but many of his ideas and reforms were carried through by later emperors. He was at the time, and still is, a very controversial character. His admirers have always seen a great defender of the people against a corrupt oligarchy, while his detractors have seen a power hungry demagogue, and an enemy of democracy. How the world might have been different if he had never lived, or perchance, if he had lived longer, is one of those perennially fascinating questions that historians have been speculating on for twenty centuries. 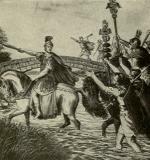 81 BC Flees from Rome during Sulla's reign of terror. 78 BC Returns to Rome; establishes a reputation as a fun-loving fop. 76 BC Captured by pirates. After being ransomed, hires ship, finds pirates who held him and kills them. 74 BC Returns from service in Third Mithradatic War; becomes active in the popular (Marian) party. 70 BC Military tribune in western Spain. 66 BC Pompey assumes command in Third Mithradatic War; Caesar becomes head of Popular party. 63 BC Elected Pontifix Maximus. Advocates mercy for Catiline conspirators. 62 BC Scandal involving Clodius and Caesar's wife results in divorce. 60 BC Establishes First Triumvirate with Crassus and Pompey. Pompey marries Caesar's daughter. 58 BC Assigned rule of Gaul with four legions for five years (later extended). 54 BC Julia, daughter of Caesar, wife of Pompey dies; conflict between the two men deepens. 52 BC Defeats Vercingetorix, his most resilient Gallic opponent. Pompey becomes sole consul. 50 BC Fearing Caesar, the Senate demands that he disband his army. Antony and others join Caesar in Gaul. 49 BC Caesar crosses the Rubicon, advancing unopposed to Rome. Pompey flees to Greece. Revolts in Spain put down. 48 BC Pompey is defeated at the battle of Pharsalia. Later he is murdered in Egypt. 47 BC Caesar pursues Pompey to Egypt. Places Cleopatra on the throne. Puts down revolts throughout empire. 46 BC Returns to Rome as sole ruler and begins reforms. 44 BC Assassinated on the senate floor by a group of conspirators. 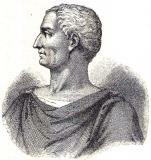 Cicero Orator. Leader of aristocratic party. Put down Catiline conspiracy. Well known writer. Cleopatra Queen of Egypt. Lover of both Caesar and Mark Antony.